The government bond sell-off continued today, with the bid-yield on the 10-year Bund climbing back above 1% this morning for the first time since September 2014. Bid-yields on the German 10-year bond peaked at 1.058% at 9:16am BST, before dropping to 0.982% by 4pm. 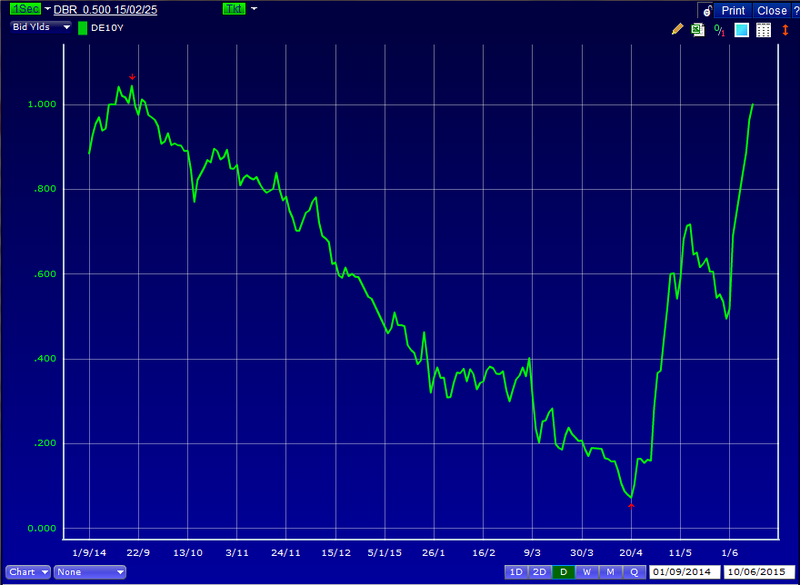 Bid-yields on the French 10-year bond peaked at 1.402% at 9:16am BST, before dropping to 1.325% by 4pm. Bid-yields on the Italian 10-year bond peaked at 2.423% at 9:14am BST, before dropping to 2.330% by 4pm. 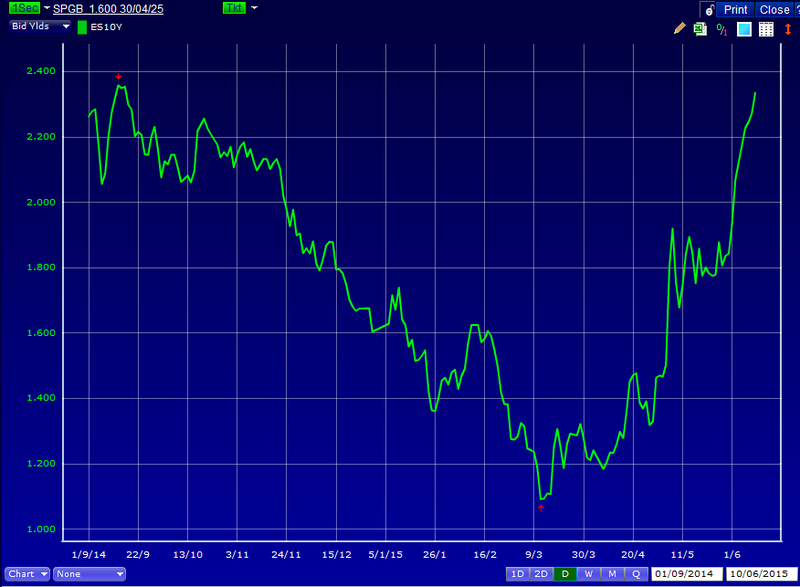 Bid-yields on the Spanish 10-year bond peaked at 2.402% at 9:14am BST, before dropping to 2.321% by 4pm. Bid-yields on the UK 10-year bond peaked at 2.163% at 9:16am BST, before dropping to 2.139% by 4pm. Bid-yields on the U.S. 10-year Treasury hit 2.493% at 12:12pm BST, before dropping to 2.478% by 4pm. Government bond yields have risen rapidly after touching record lows in April 2015 (the 10-year Bund bid-yield closed at 0.073% on April 20). In March, the ECB began buying government bonds as part of its expanded asset purchase programme. Last week, ECB President Mario Draghi said that government bond markets “should get used to periods of higher volatility”. In the United Kingdom, the Bank of England has so far maintained the pace of its stimulus programme, with members of the Monetary Policy Committee again voting unanimously for interest rates to remain at record lows on June 4. Minutes of its previous meeting showed that they are unlikely to agree on a rate rise in 2015. By contrast, Federal Reserve Chairwoman Janet Yellen signalled on May 22 that it would be appropriate at some point this year to raise interest rates and “begin the process of normalizing monetary policy”, provided that the U.S. economy continues to improve.